The NEW BowDoc Jerseys look great! Show your BowDoc Support! Want your very own BowDoc Jersey? Click HERE to order!! What are people saying about BowDoc Archery? Looking for an great Archery Program/Team for your Kids? Check out the BowDoc Archery JOAD Program! ​LOOKING FOR INTRO CLASSES OR PRIVATE LESSONS? CLICK HERE!!! CL​ICK HERE TO JOIN OUR EMAIL LIST! Arrows, Sights, Accessories and Targets. Custom Strings, Tuning, Service on all brands of bows and accessories. Lessons for total beginners to advanced hunters and world class competitors. Junior Olympic Archery Development Kids Program. Ages 8-21. Indoor Shooting Range. Kids and Adult Programs, 3D and Target Leagues. Get information about upcoming events, range schedules, and join our email list with the buttons below! BowDoc Archery provides expert service, sales, and coaching for Archers of all levels. From beginners and recreational shooters to World Class competitors, BowDoc Archery can take care of your archery needs for Bowhunting, 3D, and Target Archery. Over 35 years experience building custom strings, servicing bows, coaching, and tuning equipment. BowDoc carries a full line of Bows (Compound and Recurves), Arrows, Accessories, and Targets. 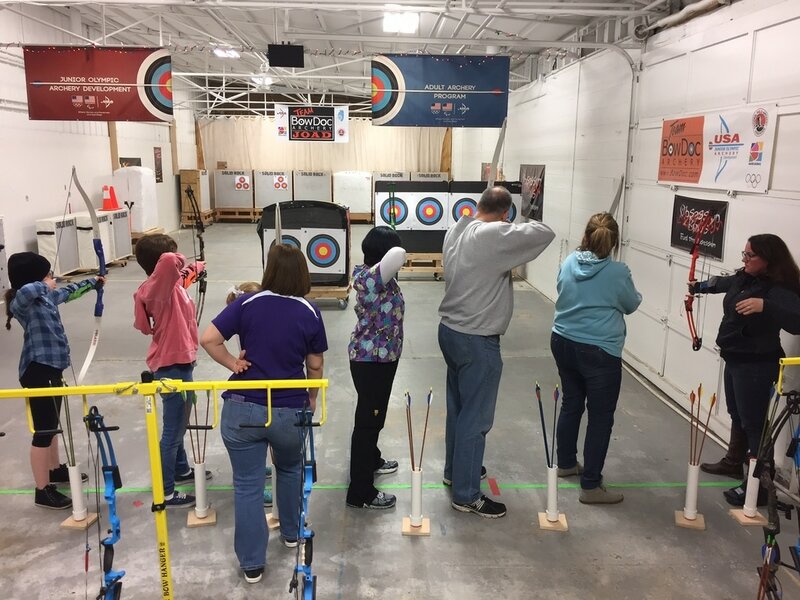 Check out the Lessons/Coaching and JOAD sections for information regarding instruction, coaching, and our highly successful kids JOAD team! Click on the EVENTS CALENDAR button to see a schedule of upcoming events, classes, workshops, leagues, etc...! Intro Classes have been moved to Thursdays!!! Thursday Intro Lessons! The perfect way to get started in Archery! ​No previous experience or equipment necessary. Click HERE to Register! Thursdays Intro Workshops for Adults and Kids! ​​Class is limited to 6 participants, so register ASAP! You will learn safety rules, range procedures, and all of the basics of shooting. There will be plenty of shooting included in the workshop! $25 per person. Space is limited, so you must register ahead of time. Click REGISTER or contact BowDoc Archery. Jeff Sanchez wins 2015 USA Archery Coach of the Year. Owner of BowDoc Archery and Head Coach of the Team BowDoc JOAD program, Jeff Sanchez was awarded the USA Archery National Developmental Coach of the year for 2015. ​Developmental Coach: Coach of a youth club, high school or junior-level coach, or a coach directly responsible for coaching athletes to the junior and elite levels. Coach Sanchez was also been nominated for the 2015 U.S. Olympic Committee's National Coach of the Year award.